CPA Exam Written Communications, commonly known as the essays, is one part of the exam that worries people. The grading is not as black-and-white as the multiple choice questions. Here is the text version for your reference. How long we manage to write? How flowery the language we are going to use? Or even, whether it helps to add charts and graphs? Surprisingly, the answer is no for all three. Written Communications are only required in the BEC part of the exam. If you are done with BEC, you may stop reading this page. For BEC takers, this section represents 15% of your grading. It is important to know how Written Communication is graded. What are the Graders Looking For? The graders want to test the candidates’ ability to construct professional, business documents. To earn points for this section, candidates must read a description of a situation or scenario, and write a document that relate or responds to that scenario. The document type is specified in the question which may include a memo or letter to a hypothetical client. How Can I Produce a Good Piece of Writing in the Eyes of Graders? Avoid using bullets point, abbreviation, diagrams, charts, number list and graph — these are a big negatives for essays for CPA exam purposes. The reason is actually more technical than anything else – your answers will likely be graded by machines (yes!) and machines are programmed to check the grammar and sentence structures. Bullet points are typically not complete sentences. You will lose point because of that. Even if you haven’t taken a creative writing class (not necessary), drafting a standard business letter should be fairly easy for you, if you’ve ever answered an e-mail in a professional setting. When it comes to business writing, don’t be fancy. Keep it short, simple and straight to-the-point. We have some tips on writing good CMA exam essays that could be helpful in this exam. Your writing must demonstrate a command of standard professional English, including correct use of grammar, spelling and word usage. The CPA Exam software includes a basic word processor that features a spell check function. Be sure to pay attention to this valuable tool. Tips: check out my review of Elements of Style on standard English writing. This grammar resource from the University of Chicago may be helpful too. Although some papers are randomly pulled and reviewed by human graders, most Written Communications questions are graded by machines. It doesn’t even matter much if you are correct in the concepts. You just have to stay on topic. Use topic keywords in your essay and be careful not to copy the text of the question word-for-word or you may lose points. As long as you demonstrate knowledge in the subject by providing details, examples and definitions, we will do a good enough job to pass this part of the exam. Make sure each paragraph in your response must establish support or summarizes the answer to the question at hand. Avoid writing more than what is needed. Write down your basic ideas on the note pad given at the testing center. Make sure your document has a clear beginning, middle, body and finally conclusion. Start with an overview where you describe the purpose or intent. Then, rewrite the question so the beginning sentence of introductory paragraph closely matches with the topic. You can get tips on how exactly this can be done in my book (see below). Then, ensure that your following paragraphs support this overview, and lead into each other well. Summarize the key points of the document on the final paragraph. Be conscious of your time limit. It is important that your piece of writing will have a complete introduction, the middle paragraphs and a conclusion. Allocate sufficient time to complete each section of the writing. 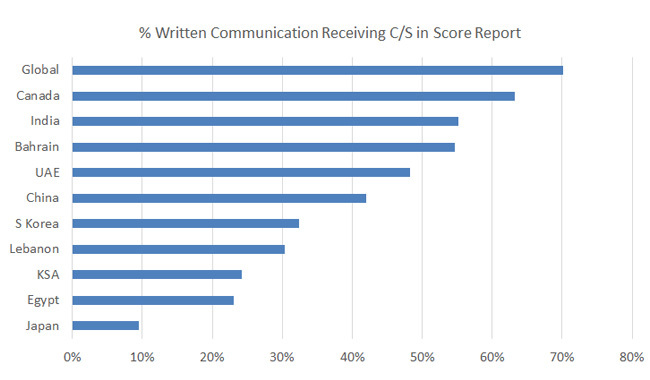 The following chart shows the percentage of “comparable” or “stronger” in score reports, by country. You can see this as something similar to the pass rate. Obviously, your performance may not be the same as your peers, but this is one data point you can refer to. If you are from a country with a relatively low percentage, you should get better prepared. I hope these CPA exam written communication tips can ease your concern on this part of the exam. In terms of how you can actually follow these steps, you’ll need to get my book to find out! Here is a more detailed discussion of my book, and how you can get your own copy.